You want to set up Norton Core from scratch. Your Norton Core is not working. If you perform a factory reset, you have to set up Norton Core from scratch. This includes, linking Norton Core with your Norton account, setting up your wireless network, and adding all users and devices to your protected network. Launch the Norton Core app. Tap Settings > Router > Reset. If you choose this option, in addition to a factory reset, Norton Core wipes all your Norton Core-specific data stored in the cloud. Read the on-screen instructions and tap Reset. In the confirmation screen, tap Confirm. The light under the Norton Core router blinks rapidly indicating the reset. After your router resets, the light stops blinking rapidly and lights a blinking white. After the factory reset completes, the Norton Core app displays the welcome screen. In the Welcome to Norton Core screen, tap Set Up Norton Core. Follow the on-screen instructions and set up Norton Core again. If prompted to sign in, enter your Norton account credentials and sign in. Confirm to any prompts for action to use your old network settings. In the Name Your Network screen, provide the network name (SSID) and password for your wireless network. You can reuse the same network name and password that you had used earlier. Make sure that the Norton Core router is plugged in and has power. 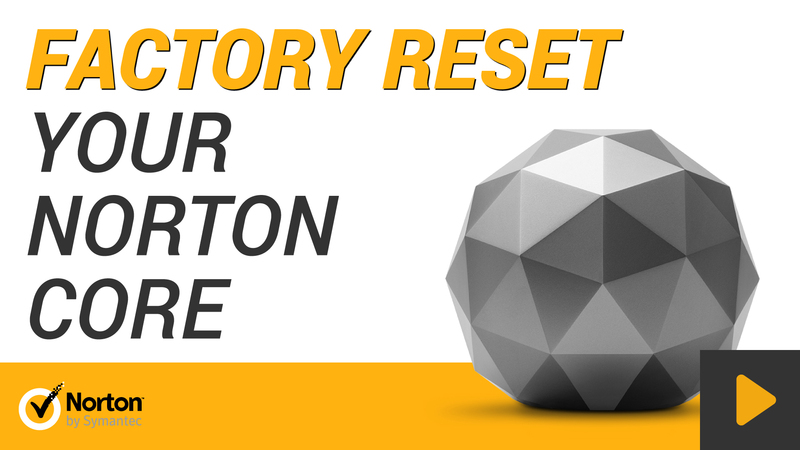 Locate the reset button underneath your Norton Core router. The reset button is the left-most button marked with a rounded arrow (↺). Press and hold the reset button for 10 seconds and then release it. If you choose to reset using the reset button, Norton Core does not erase your personal data on the cloud.